In Lim Meng Suang v Attorney-General (2014), the Singapore Court of Appeal held that s 377A of the Penal Code, which criminalises acts of “gross indecency” between men whether occurring in public or private, does not infringe either the rights to equality and equal protection guaranteed by Art 12(1), or the rights to life and personal liberty guaranteed by Art 9(1) of the Constitution. 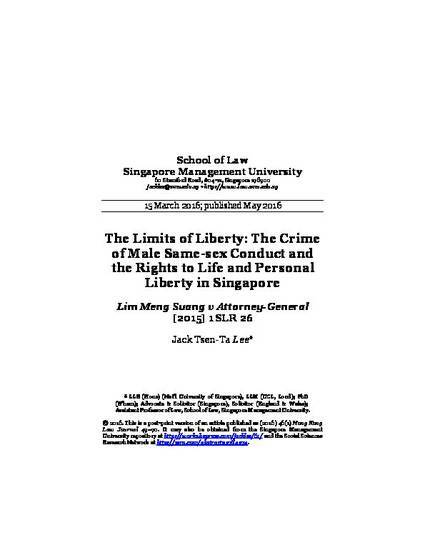 This article examines the analyses of the latter provision by the Court of Appeal in Lim Meng Suang, and by the High Court in Tan Eng Hong v Attorney-General (2013) which was one of the two cases brought before the Court of Appeal. It is submitted the courts interpreted Art 9(1) narrowly due to the belief that it is not their role to subject government policies to rigorous constitutional scrutiny for compliance with fundamental liberties, particularly where such policies are seen as dealing with socially controversial issues. However, the time is ripe for the Court to discover afresh its role as a co-equal branch of the government. © 2016. This is a post-print version of an article that was published as (2016) 46(1) Hong Kong Law Journal 49–70. It may also be obtained from the Singapore Management University repository at http://works.bepress.com/jacklee/61/ and the Social Sciences Research Network at http://ssrn.com/abstract=2784274.